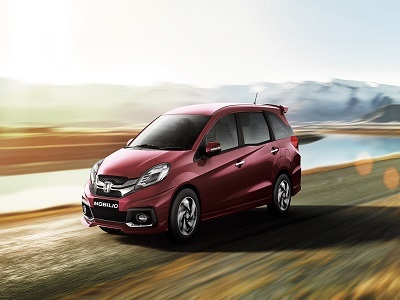 Honda launched Mobilio, its first multi-purpose vehicle in India. New Delhi: Japanese auto major Honda today launched 'Mobilio', its first multi-purpose vehicle in India, priced between Rs 6.49 lakh and Rs 10.86 lakh (ex-showroom Delhi) as part of the strategy to achieve total annual sales of three lakh units by 2017. Mobilio, which comes in both petrol and diesel variants, will take on mainly Maruti Suzuki's Ertiga and General Motors' Enjoy to an extent in the MPV segment. Petrol variants of the seven-seater Mobilio will retail between Rs 6.49 lakh and Rs 8.76 lakh while diesel versions will be available between Rs 7.89 lakh and Rs 10.86 lakh (ex-showroom Delhi). On the other hand, Maruti Suzuki's Ertiga is priced between Rs 5.8 lakh and Rs 8.49 lakh (ex-showroom Delhi). The petrol variants retail between Rs 5.8 lakh and Rs 7.3 lakh, while the diesel versions are priced between Rs 7.22 lakh and Rs 8.49 lakh. Honda Motor Company Managing Officer Yoshiyuki Matsumoto said India remains one of the company's key strategic markets and Mobilio will contribute significantly to HCIL's growth in India. "Mobilio is already a success in Indonesia, selling 46,000 units since its launch in January capturing 23 per cent market share in the segment. We expect the same success in India and will try to sell as many units as we can here," Matsumoto said. He further said: "Honda has set a target of selling six million units globally by March 2017, out of which 1.2 million will come from the Asia Oceania region. HCIL will account for 25 per cent of the region's sale." Bullish on the new model, Honda Cars India Ltd (HCIL) President & CEO Hironori Kanayama said: "The launch of Honda Mobilio follows the success of Honda Amaze and the all new City which led our exceptional growth of 83 per cent in the previous financial year,"
He further said: "HCIL is progressing well to achieve its target of achieving annual sales of three lakh units by 2017." During the fiscal 2013-14, Honda Cars India reported 83 per cent increase in sales at 1,34,339 units as against 73,483 units during the previous year. Mobilio has been developed at Honda's R&D facility in Bangkok exclusively for the Asian markets with India and Indonesia among key targets. In India, Mobilio will roll out from the company's Greater Noida plant which has an annual capacity of 1.2 lakh units.